Two kilometers downstream (five kilometers below the Marten confluence) is a rapids that we call, “Lost Canoe Rapids”, “Sunken Canoe Rapids”, “Velcro Rapids”, or simply “Island Rapids.” The first two names refer to a story in Heb Evans’ The Rupert That Was, in which the heavily aerated water on the island side of the right channel sank a canoe. The swamped canoe was pulled under as its inhabitants jumped to the safety of the canoe following them. It did not resurface. The gear was rescued, but the canoe was nowhere to be seen. Heb describes the guide, Nishe Belanger, in a lonesome vigil, leaning on his paddle, watching downstream for two hours while the boys dried out and lunch was cooked and eaten. Later that day they found the canoe, four kilometers downstream, undamaged, swamped in the reeds deep in a bay on the north shore. Taking heed of this story we planned to portage the rapids each year. We portaged the center island in 1991 and 1992. This maneuver required us to descend one at a time to the island, essentially sticking the canoe broadside to its western, upstream point like Velcro. In 1992 two canoes were caught and spun, but escaped, good-sized whirlpools in the scissors action eddy below the island. So a more sensible plan prevailed in 1993 and 1998. There is a deep bay to the north midway through the rapids, and above the heavy surge of its main drop. We ran down to the bay and eddied out before reaching the aerated water. There is a nice campsite on the north shore above the bay and a lift-over portage on the spit of land that forms its west bank. Seven kilometers downstream paddle along the north shore across the top of the falls at the sharp south bend in the river. Follow the creek off the river above the falls on the river right/northwest shore. The portage landing can be found at the far end of the creek/bay (where the creek becomes a cascading brook). It is 750 yards. In 1992 we camped here on the portage 50 yards from the downstream landing. A fire has since destroyed that campsite. In 1993 and 1998 we pushed on five kilometers downstream to a Cree camp on the south shore where the river straightens for its long shallow run to Lac Nemescau (about 75° 35’ West). Stick to the west bank and run the swells below the falls along the shore and out of the fray. A kilometer downstream find the last rapids above Lac Nemescau. We ran this rapids each year. In 1991 and 1992 we ran the right/north side at the top and then crossed the river, above the large haystacks, to the black water on the left/south side of the main channel at the bottom. This proved to be a difficult task in the higher water of 1993. With Chad Nelson, I managed to get across, but not before taking on a significant amount of water. The rest of the section, seeing the steep pitch of the standing waves we had climbed and descended en route, chose a shore path through the rocks and ledges on the north bank. This latter route also proved passable in the low water of 1998. The campsite is three kilometers downstream on the south shore. It is a large Cree camp just at the point where the river straightens out (about 75° 35’ West). The village of Némescau is a half-day’s paddle from the Cree camp. We always kept to the north channel except at the wishbone-shaped island before the bay containing Pointe Némiscau where we steered the middle course. One reason for keeping to the north shore was to obscure the old village of Némescau from sight until the very last moment. In 1993 the old red-roofed Hudson's Bay Post building still stood atop the hill at the south end of the village. We would stop for a quick wash in the narrows on the east side of the north point. We never knew whether anyone would be at Nemiscau, so the lads were always wound up with anticipation and apprehension. The first glimpse of the red roof of the old post as one rounded the point sparked a feeling that cannot be properly described in words (although a swelling in the heart and a tingle in the spine would come close). The canoes would naturally line up six abreast and the boys would pull together with stout strokes for the two-kilometer crossing, carefully scanning the village for the smoke of a curing fire. This is the site of the old village of Nemiscau that was abandoned after the post closed. A new village called Nemaska was later built at Champion Lake as part of the original James Bay Agreement. The Nottaway-Broadback-Rupert Phase of the James Bay Hydroelectric Project (NBR) has long since been sent to the back burners, and many of the families of Nemaska have returned to Nemiscau to rebuild their old homes. The Cree treat the village as a second home. It is my understanding, culled from conversation with the Cree, that part of the plan is to establish residency rights in order to block any future NBR development plans. The village has grown significantly since 1991. It was a village of wall tents when we first visited, having just started to return. The Cree were milling lumber for a set of two new winterized cabins, which now stand just north of the old post, that were to serve as a cafeteria and a meeting house. The buildings now serve as community space. In 1998 the old post buildings were gone. Sadly, they had burned along with the sign, familiar to anyone who traveled in the north country of Quebec and Ontario prior to the break-up of The Company, that read “Hudson’s Bay Company, est. May 2nd, 1670.” But the cabins that adorn Heb Evan's photos of the village from 1964 and 1966 had mostly been rebuilt. There is now a small church building at the landing at the north end of the village. There was a small, temporary lumber mill set up in the swampy bay north of the village where the Revillon-Frères’ (The Revlon Brothers, Danny) and independent traders apparently kept shop in days gone by. And, just north of the main landing, the jack pine hung with bear skulls and moose shoulder blades pictured in Heb Evan's book The Rupert That Was, still stands, a little taller, a little more gnarled, but still adorned as it was. The only year that we found the village uninhabited was 1993, and this was due to a revival meeting at Waswanapi. We always asked permission to visit before bringing the section ashore. We always camped in the grassy clearing up by the community meeting houses. And we always stayed two days. Alternatively, one could camp south of the old post buildings, on the sandy point at the south end of the village. Heb Evans, The Rupert That Was, The Highway Bookshop, Cobalt, Ontario, 1978, 219 pp. 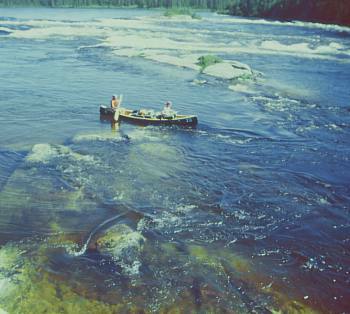 Follows the 1964 Keewaydin Rupert River trip. Available from Highway Book Shop or call 800-461-2062.